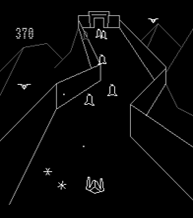 Fortress of Narzod is an arcade shooter that was released exclusively on the Vectrex (although a homebrew port exists on the C64). Your mission is to scale a mountain range, destroy enemies and eventually take control of the fortress. Each difficulty level consists of three battlefields and each of these is made up of three waves. The first battlefield isn't too tough as you'll only encounter a few enemies and the occasional projectile. The difficulty ramps up in the second area as you'll face more projectiles as well as Warbirds that swoop in and obstruct your line of fire once they've been shot. The third battlefield is a real challenge as the Warbirds can now fire and the bullets come towards you at a much faster rate. Eventually you'll face the Mystic Hurler who protects the fortress by moving quickly from side-to-side while throwing projectiles in your direction. It's tough to beat him but if you manage to do so the game will loop and you'll move onto Level 2. Fortress of Narzod has a fantastic risk / reward element; the best method is to mix things up and occasionally shoot directly onto a flat wall (i.e. towards the back of the playing field) as these seem to have a higher hit rate than relying on your bullets that ricochet off angled walls. It's very dangerous doing this as they bounce straight back in your direction meaning you have to really pay attention to avoid them. This constant battle between playing it safe and gambling is a simple but effective gameplay mechanic that makes for an enjoyable arcade experience. There's some nice scaling effects as enemies get closer to you and the sound effects are pure arcade goodness. My only criticisms are that the collision detection is a bit off at times and there's no real pacing as even beating Level 1 is a major challenge. Fortress of Narzod is one of the standout gems in the Vectrex library. At first glance it appears to be a simple arcade shooter but it has some unique and deep mechanics that help keep the gameplay interesting for repeated playthroughs. Random trivia: There's a very strange way to get unlimited lives in this game. Basically, you must be on your last life and kill the Mystic Hurler at exactly the same time as his projectile hits you!